I’ve recently had a realization that I wanted to share, about the chore that Gothren’s Mouth (Mallon Ryon) gives you – to ask Baladas Demnevanni three questions. It always stood out to me as a strange and deceptively simple quest, even the first time I did it, with possibly more going on than meets the eye. You must locate Baladas and ask him three questions, but Gothren is not interested in the responses to said questions, nor is he interested in whether Baladas even answers them at all. On my very first playthrough, I was naive and thought they must just be buds, and Gothren just wanted to make Baladas think. But I think I have figured out what is going on – I think you are a patsy (possibly one of many given deceptively simple chores) manipulated into helping Gothren flush Baladas out of hiding. Possibly so Gothren can send somebody to kill Baladas. 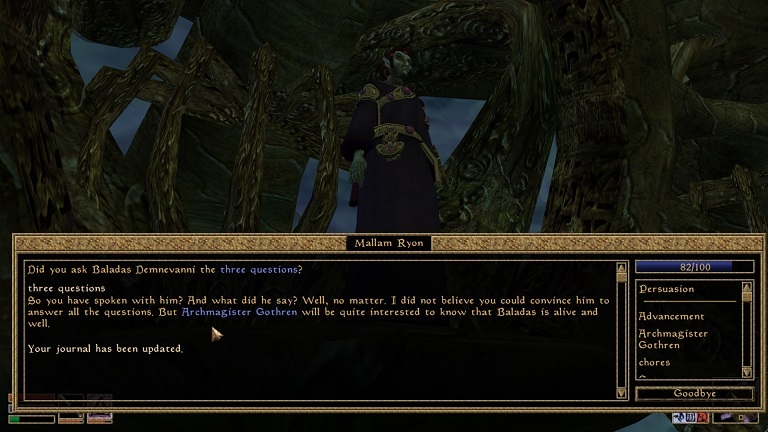 There is precedent in-game to suggest that Telvanni politicians flee from Telvanni territory and go into hiding when “forced to retire from politics,” and there is enough evidence to suggest that Baladas is one such Telvanni politician. Given Telvanni tradition dictates that murder of your rivals is a perfectly acceptable means of removing obstacles, flight is a reasonable response. And it makes sense that said Telvanni politician would be a target, even in retirement, because (as we see with Eddie and Baladas) if/when the tides turn then they have a habit of coming back. Fast Eddie has fled to Balmora, and he tells you quite explicitly that his political career was ended abruptly when Dratha and Neloth conspired against him and forced him out, and that he is now in hiding until things blow over. Baladas used to serve on the council, but he says he’s sick of the constant rat race that is Telvanni politics. We know from villagers in Gnisis that Baladas arrived there about twenty years ago, and has holed himself up in an old Velothi tower like a hermit. It seems likely to me that Eddie and Baladas were both forced out around the same-ish time, since they are both considered allies/assets to Aryon and therefore I think aligned politically (Aryon asks you to convince Baladas to re-join the council so you and he can have more support and political allies, and Aryon is the one to suggest Fast Eddie to you as a potential protege – so presumably the three share similar politics). By the transitive property, this implies that Baladas and Gothren are political opponents (we all know how Aryon feels about Gothren). This suggests that about 20 years ago, the Telvanni council had a much larger progressive coalition that was forced out, with Aryon being the main holdout that they haven’t been able to get rid of (unless his rise to power came after that, but >20 years seems about right for how the people of Vos talk about him; I think he’s just managed to hold on). If/when you find Baladas Demnevanni, he is all the way over in Gnisis – about as far from Telvanni territory as he can get – and he is holed up in Arvs-Drelen, with skeletons and summoned daedra patrolling the halls which will attack anybody on-sight. On top of that, Baladas is behind a locked, trapped door. This guy is not rolling out the welcome mat. At first I just thought it was because he was a hermit, and literally didn’t want anybody disturbing him, but now that I think he is in hiding, I think he is taking all these precautions to protect his life. It seems to me now, that Gothren wasn’t even sure whether Baladas was still alive. He wants to confirm whether Baladas is alive, and if so he is starting some of the early moves in flushing him out. That’s what the whole “three questions” thing was about. That’s why Gothren doesn’t care what the answers are, or even whether the questions are answered at all. Just that you can find him and physically speak with him face-to-face. When you turn in the quest, Mallon Ryon says “So you have spoken with him? And what did he say? Well, no matter. I did not believe you could convince him to answer all the questions. But Archmagister Gothren will be quite interested to know that Baladas is alive and well.” which all of a sudden, on this latest playthrough, sounded so sinister and foreboding! I never noticed that possible tone before. This entry was posted in Gaming, Obervations, Stories, Videogames and tagged baladas demnevanni, Gothren, Master Aryon, Morrowind, Telvanni, The Elder Scrolls. Bookmark the permalink.